A huge oil palm development - covering 1.3 million hectares is to be developed on the site of the failed "PLG" rice mega-project in Central Kalimantan. The provincial parliament has agreed to investment plans by Bomer Ltd (reportedly a Swiss-Malaysian company) to develop the area under the nucelus estate - small-holder model. The appalling ethnic violence in Central Kalimantan is rooted in the decades-long violation of indigenous rights and the wholesale destruction of natural resources in the province. 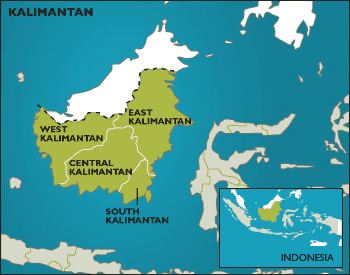 Tension remains high in Central Kalimantan following several weeks of ethnic violence in which an estimated 500 people have been killed and up to 80,000 have been forced to leave their homes. This is the latest bout in a long history of violence in Central and West Kalimantan. The government has decided that the repackaged Kalimantan mega-project will not after all go ahead, due to the huge problems the original project created. The disastrous million hectare project to convert peat swamp forests to rice-fields was launched in 1995 but was finally halted last year after the catastrophic environmental impacts became obvious. Transmigration, the government programme which resettles families from Java and Bali to lesser populated islands, has contributed to underlying tensions between communities in Maluku, recent scene of bloody clashes between Muslims and Christians. Now the government is preparing to send refugees from this and other conflicts back into the transmigration programme - a policy which may lead to yet more conflict in the future. The Central Kalimantan Mega-project, or 'PLG', as it is known in Indonesia, has been an unmitigated disaster. The ecology and biodiversity of a vast area has been devastated; indigenous communities have lost their resources and livelihoods; and the transmigrant families who were brought in to work on the project remain dependent on government assistance as their harvests fail repeatedly.